90694BCT G-22 Unk 3rd Gen. Right front of slide factory stamped "PROPERTY OF BEXAR COUNTY TEXAS"
06*** DPD G-22 February 1998 2nd Gen. Detroit PD unissued - Verified via Glock, Inc.
07***DPD G-23 February 2004 3rd Gen. Detroit P, Verified via Glock, Inc.
252ECP G-22 mAY 1993 2nd gen ??? 2426**FC G-23C Unknown 3rd Gen. Marked "Fulton County, Ga. Sheriff's Dept." on right side of slide. MCSD*** G-22 02/1994,12/1997,11/1996,05/2000 2nd Gen. County Sheriff’s Dept. - dated by TopGlock "MCSD"
MPDC G-17 September 1990 2nd Gen.
OPD0** G-22 Unknown 3rd Gen. There are approximately 400 G22 Gen 3 Glocks with S/N starting with OPD0***. Came with extended slide release and Trijicon night sights. These were brand new never issued pistols for the Oakland Police Department. After receiving the order for the Gen 3, the Gen 4 were released and OPD got rid of the 400 Gen 3's without issuing them. I have one and 4 other buddies of mine have 1 each. SA****TX G-22 March 1996 2nd Gen. San Antonio Police Department, dated TopGlock "SA/TX"
The G17, G17L, G22, G24, G31, G34, G35 and G37 share the same frame. The G18 frame is unique to the G18. 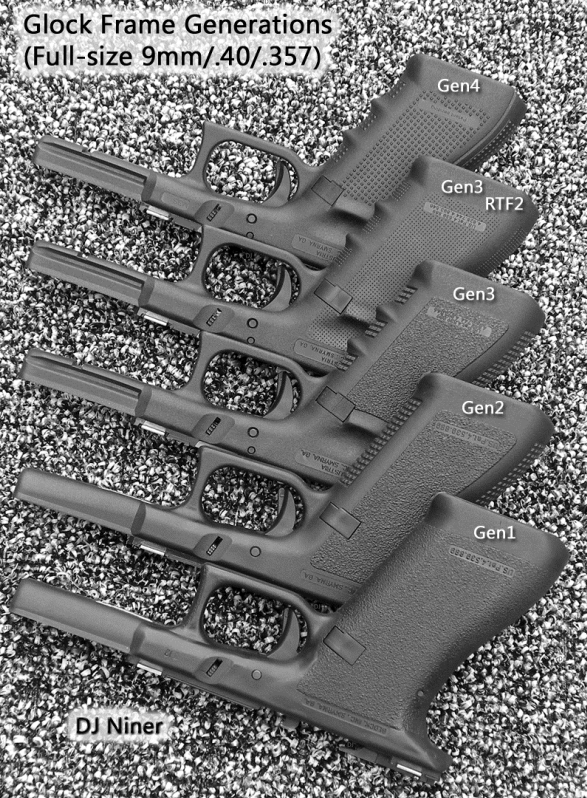 The G19, G23, G32 & G38 share the same frame. The G26, G27, G33 & G39 share the same frame. The G20 & G21 share the same frame. The G29 & G30 share the same frame. The G36 frame is unique to the G36. 1. The slide locking back on a full magazine. 2. Failure to lock into battery because the barrel lug drags on the slide lock. 3. The magazine follower tips or sticks in the magazine tube. Glock, Inc. announces a production change of the firing pin safety system. This new firing pin safety system has been installed in all production Glock pistols since November, 1991. A voluntary upgrade is being offered to maintain the Glock tradition of ensuring that all of our pistoils are up to the latest standards in 21st century Goock technology. Most importantly, the components of the new firing pin safety system are not interchangable with the components of the old systam and Glock will always strive towards maintaining this feature of interchangability while working to ensure future interchangability. The upgraded firing pin safety has a new surface finish making it nearly 100% saltwater corrosion resistant. Also, after rigorous and extensive testing, the new system proves to be more durable and has a longer useful life. Here, as alwyas, Glock is working toward maintianing its standard of perfection. Glock Model 19, 9mm Luger caliber, requires an upgrade for all pistols. These pistols have the potential for an UNINTENTIONAL DISCHARGE of a cartridge with the action open. The Glock model 19 pistol slide has a bottom protrusion, whose function is to push cartridges from the top of the magazine into the chamber. When the pistol is jammed in a double feed situation, the slide protrusion can come in contact with the primer of the jammed cartridge and cause UNINTENTIONAL DISCHARGE while the action is open. Glock Model 26, 9mm caliber, serial numbers DGU, DHR DKU. Glock Model 27, .40S&W caliber, serial numbers DGD, DGV, DHS, DHT, DKV, DKW, DKX. Mr. Don Bulver, warranty department of Glock, Inc., indicated the recoil springs produced before September 1999 may shear off on some of these pistols due to over hardness of the support tube. Replacement springs will be distinguished by a vertical mark from the center on the front polymer portion of outer ring of the guide rod assembly, which will appear to be a mold line. The GLOCK Corporation has identified a problem with a very small percentage of GLOCK pistols produced between September of 2001 and May of 2002. The specific problem that has been identified is the potential of breaking a rear frame rail in pistols manufactured during this time period. Within the specific range the breakage rate has been less than 0.0188%. So, while the actual percentage of rails reported broken is within any accepted manufacturing tolerance, it is not an acceptable situation to the GLOCK Corporation. It is also important to note that under most conditions GLOCK pistols will continue to function with three rails. A routine maintenance check after each time the pistol has been taken out and used would immediately indicate if there is a problem. We are, therefore, concerned that a limited number of customers will not get the product we have promised them and what we have always delivered, the very best pistol on the market, in short, a GLOCK. For these reasons, we have made the decision that in the interest of customer service, replacement frames will be offered to anyone who has a firearm in this range and decides to take advantage of this offer. The replacement frames will have identical serial numbers to our customer's original firearm except the numeral 1 will be added as a prefix. If you believe your firearm is within this range, please call 1-866-225-4098 to take advantage of the ultimate in customer service. Nothing less than the best for our customers is acceptable to GLOCK and, as always, we will continue to work towards Perfection. It appears that only serial numbers starting with "E", "GSSF", or "USA" (American Hero’s Commemoratives) are affected. In general, the chronological serial number set that has the prefix letters of "EKA" through "EVR" inclusive appear to be the affected Glocks, regardless of caliber. Three letters precede three numbers on a plate forward of the trigger guard on the underside of the polymer frame. However, some aberrations to this generalization have been reported by GTers. Reports are that the affected Glocks were manufactured from September 2001 to May 2002. So if you bought (or won a GSSF Glock) an "E" or "USA" series Glock in September of 2001 up until the present day, you might have an affected Glock. Unfortunately, Glock has not published a list. Hope this helps, but again, if you are responsible enough to own a gun and can read this, you are smart enough to check for yourself by calling Glock. Glock Serial Number Research Project Show/Hide <-- First time here? Click to get instructions! This is a database of owner supplied data. If you don't find yours listed, look in your paperwork for the little brown envelope containing two fired casings. What's the date on that envelope? Don't have it? Then please call GLOCK, US Inc. and ask them. This page was derived from years of work on the Glock Talk forum by the users MakeMineA10mm, Dandapani and GSD17. They obviously put untold hours updating the original threads and it's an amazing compilation. The purpose of this list is to be a resource for people who wonder what the "born-on" date of their Glock is, and to provide a historical record, which, if ever it is complete enough, can indicate some information about caliber trends, model popularity, production changes, etc. You can decide how much of your serial number you want posted. There are no usernames, IP addresses, or any other possibly personally identifying information I record. What you see is what you get which is all I have. When entering the serial put in as much of it you would like to be shown and the system will pad the remainder with asterisks. i.e. If you enter SNR000 it will display as SNR000, but if you enter SNR0 it will display as SNR0** and if you enter SN it will display as SN****. Click on Generation and it will pop up a little guide that can help you identify what you have. I will be adding Gen4 info to it shortly. HelpEnter as much, or as little, of your serial number as you want, but do not use spaces or other special characters or you will receive an error. aka Test Fire Date HelpThis can be found on the little brown envelope that came with your pistol new. If you don't have the envelope you can call GLOCK, US Inc and they can provide it to you. - 1st Generation has the smooth, rounded "pebble-grip". - 2nd Generation has the "Grenade-style" checkering on the front and back strap areas with NO fingergrooves. - 3rd Generation has BOTH fingergrooves AND accessory rail on the front dustcover. - 4th Generation has the "RTF3" on the grip sides. 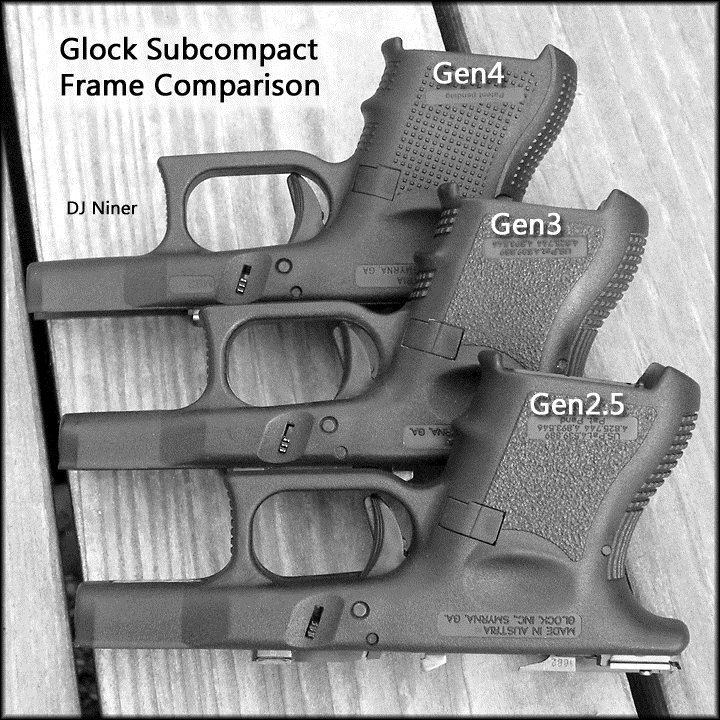 - If you have a subcompact (G-26, -27, -28, -29, -30, -33, -36) OR a "transition model" when Glock was putting fingergrooves but no accessory rail, then you have a 2.5 Generation. There is even a slight variation here, as some of the earliest G-26 & G-27s had smooth fingergrooves, without checkering in-between the grooves. Some people do not count the sub-compacts as 2.5 Gen since they came out after the 3rd Gen frames were already being made. Note: newer -29, -30 are now coming with rails. The only Glocks that came with generation 1 frames were models 17, 17L, 18, and a small number of G19's that were cut down from G17 frames. The first Glocks with the finger groove frames were the G26 and G27. The first Glocks that were originally made with generation three frames were the G34 and G35. Full assembly of GLOCK pistols begins in the U.S.
Introduction of the G37 in .45 G.A.P. Introduction of the G41 (.45 auto), G42 (.380), and threaded barrels. This is NOT an official site of GLOCK, INC or any of it's subsidiaries. It is a fan site. All copyright is held by their respective owners.